The Ranar CBX 2024 is a low cost, economical, screen exposure unit designed for the entry-level t-shirt printer working from home. 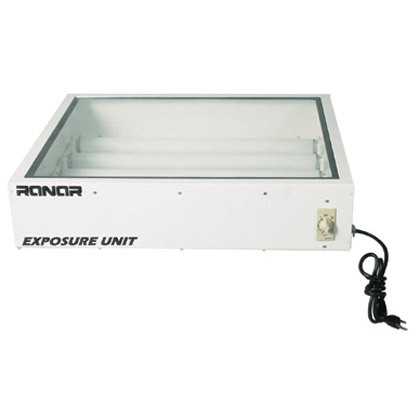 This screen exposure unit has an exposure area of 20x24, and features UV black-light fluorescent bulbs (20 watts each), analog timer, a padded weight to compress for positive film-to-screen-glass contact, and 110 volts. With this economical screen exposure system, you can now "DIY" and make quality screens at home for a fraction of the cost of having someone else doing that job for you. 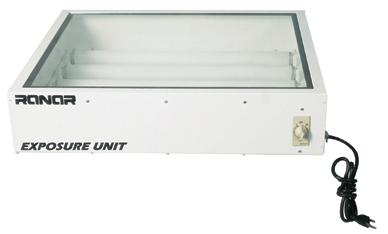 When working from home silkscreening t-shirts , the exposure unit is one of the pieces of equipment often overlooked. The CBX is one of the critical pieces of equipment in the Start up kit. Screen exposure is defined as transferring an image from a film positive to a screen to make a stencil so ink can pass through. Screen exposure, burning, and shooting an image are three terms associated with this process. 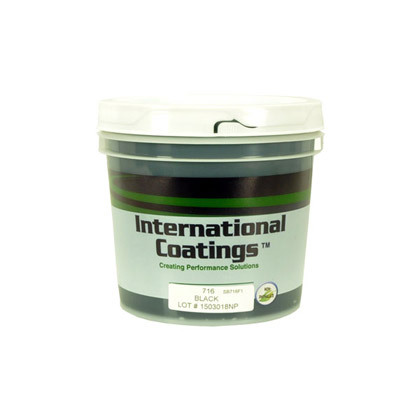 Exposing screens in your garage with direct photo emulsion is now easy with our screen making starter kits.